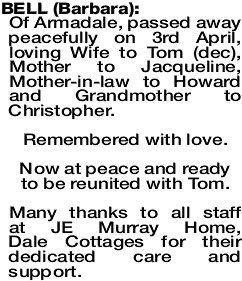 Of Armadale, passed away peacefully on 3rd April, loving Wife to Tom (dec), Mother to Jacqueline, Mother-in-law to Howard and Grandmother to Christopher. Now at peace and ready to be reunited with Tom. Many thanks to all staff at JE Murray Home, Dale Cottages for their dedicated care and support. The Funeral Service to Celebrate the life of Barbara Enid Bell will be held in our Chapel, cnr Albany Hwy and Armitage Rd, Kelmscott on FRIDAY (12.04.2019) commencing at 2:00pm. Deepest sympathy to the Bell family on your sad loss. The Board, Staff and Residents of Dale Cottages Inc.